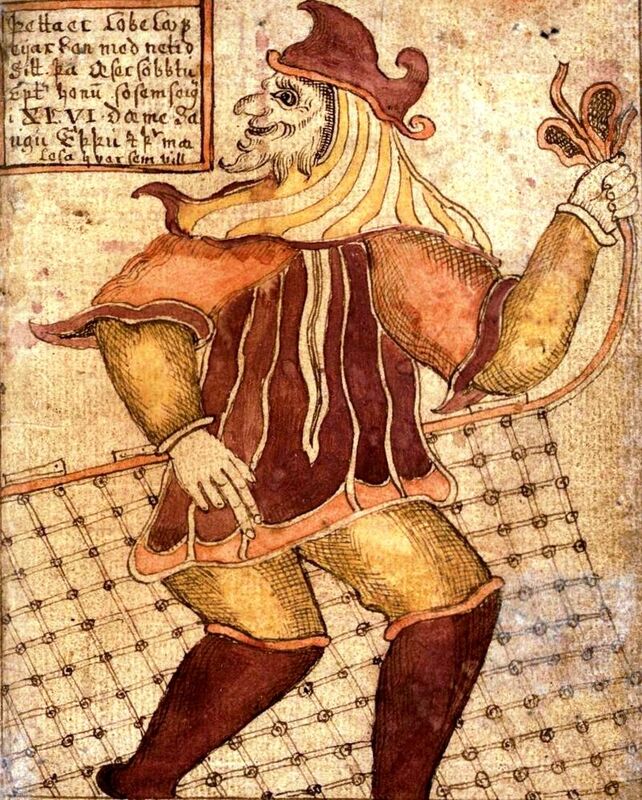 We all know who Loki is (the image above is from the 1700's Icelandic Manuscript, SÁM 66). Today he is seen as a trickster in Norse mythology. Loki had several children and was something like a great-uncle to another god Freyr in the mythological genealogy. Freyr was an ancestor of the Ynglings which was a dynasty of humans. The Ynglings transitioned from mythology to historical figures in the Middle Ages (incidentally one Yngling was Harald Fairhair who violently unified Norway and led to the exodus of families to Iceland, one descendant of which made the image of Loki above) so in a sense Loki's descendants are distant cousins of humans. ...and it turns out that Loki has a castle that was discovered in 2008. 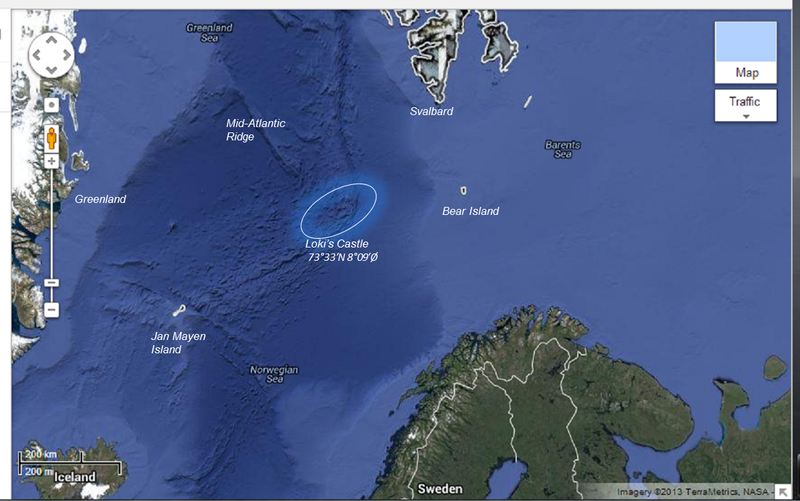 Loki's Castle is an undersea structure midway between Norway, Greenland, Jan Mayen, and Svalbard. In 2015 Spang et al. 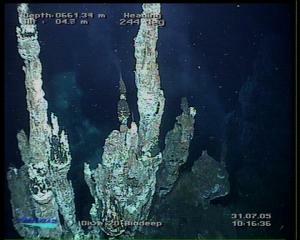 recovered several unusual Archea from the sea floor near Loki's Castle and named them Lokiarchaeota. They share several genetic features with us, the Eukaryotes. Many of us are now familiar with three domains within the tree of life in the figure above (it is tempting to make another mythological reference here---Tree-of-life---but I have probably already gone to far with the references to Loki and Freyr above): Bacteria, Archaea, and Eukaryota. We are most familiar with multicellular eukaryotes which make up the large forms of life we see around us, animals, plants, fungi. We know about the bacteria which are also common, around us, responsible for some human diseases, and required for healthy ecosystems and digestive tracts. The Archaea are more mysterious. They are single celled microbes that are around but not as abundant as bacteria; they are known for inhabiting extreme environments like high salt concentrations and high temperatures, but are also found in normal environments. In the phylogenetic reconstruction above the Archaea are closer related to Eukaryota than Bacteria but are still a distinct domain of life. In recent years there have been hints here and there that this picture might be wrong and that the Archaea and Eukaryota are actually even more closely related. When the Lokiarchaeota from Loki's Castle were included in a different kind of phylogenetic tree there was a bit of a surprise. 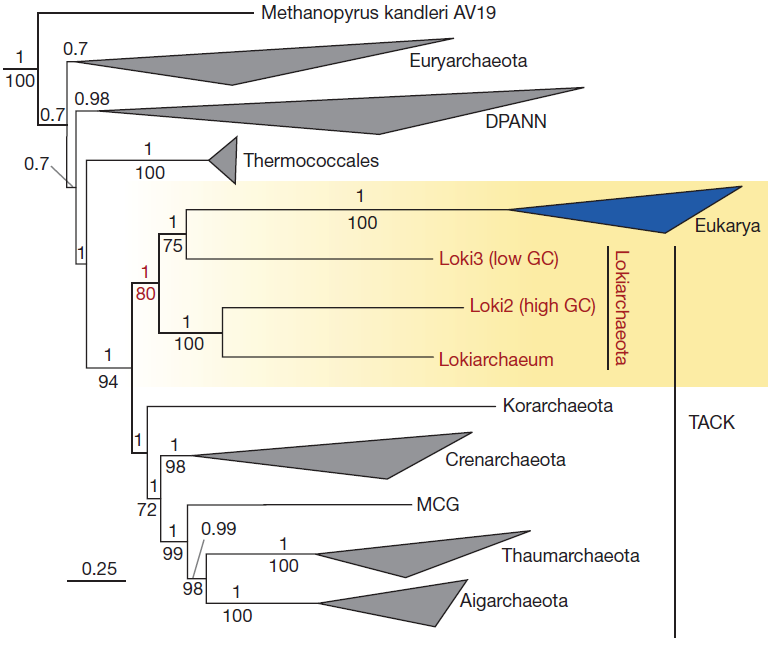 The Lokiarchaeota are Archaea; however, genetically the "Lokis" are closer related to the Eukaryotes than to other Archaea. In a giant coincidence of taxon naming and mythology (with the right stretch here and there) we are in fact not too distant (within the scale of the tree of life) cousins of the Lokis! 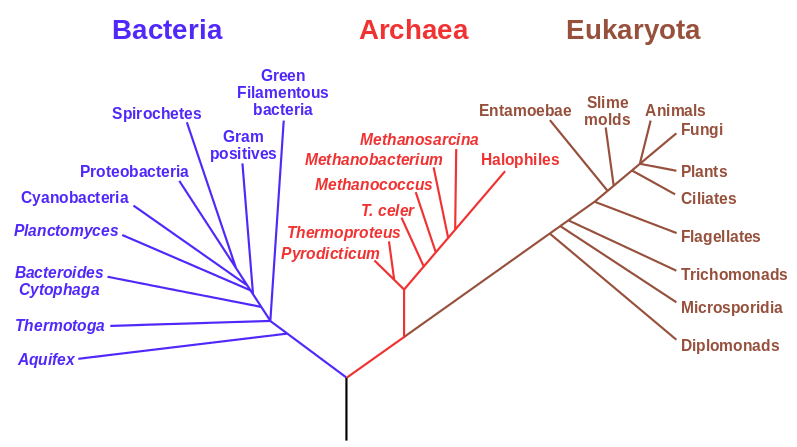 And, importantly, this places Eukaryotes within the Archaea; the Eukaryotes are not just related to the Archaea we are directly descended from the Archaea. Eukaryotes have complex cell structures with many types of membranes. The term "eu-karyon" means "true kernel" and refers to the cell nucleus where the chromosomes are stored surrounded by a membrane. There are also mitochondria that are surrounded by their own membranes (and have been secondarily lost in some Eukaryote protists like giardia)---and several other membrane bound organelles exist in Eukaryotic cells. The Lokiarchaeota's "genomes encode an expanded repertoire of eukaryotic signature proteins that are suggestive of sophisticated membrane remodelling capabilities" Spang et al. (2015). Okay, so now the Eukaryotes are nested within the Arcaea and there are only two domains of life. Are there any other big surprises left? Well... There have been hints in recent years that a strange group of bacteria exists. Sticking with the theme of this post the idea of a "hidden people" is common around the world's cultures (from Huldufólk Elves in Iceland to Jinn in the Middle East to the Cherokee Nvne'hi and the Menehune here in Hawai'i). These hidden people usually have unusual properties. There seems to be a large part of the tree of life that is widespread and exists, and likely has a large indirect effect on the world around us, but until recently has been completely invisible. And, it turns out that these appear to be very unusual cells. Traditionally in order for new bacteria species to be formally described they need to first be cultured in the lab. However, it is well known that most bacteria that exist in the wild cannot be cultured with standard methods. Capturing DNA from the environment and sequencing it has revealed some strange sequences that appear to belong to bacteria but are very different from any described bacterial phyla---but, many of these mysterious bacteria, while diverse, appear to be closer related to each other than to the known bacteria and this has been referred to as the "Candidate Phyla Radiation" or CPR. Earlier this year Hug et al. attacked this problem head on and made an updated tree of life that includes a large number of these little known and uncultivated mysterious bacteria. 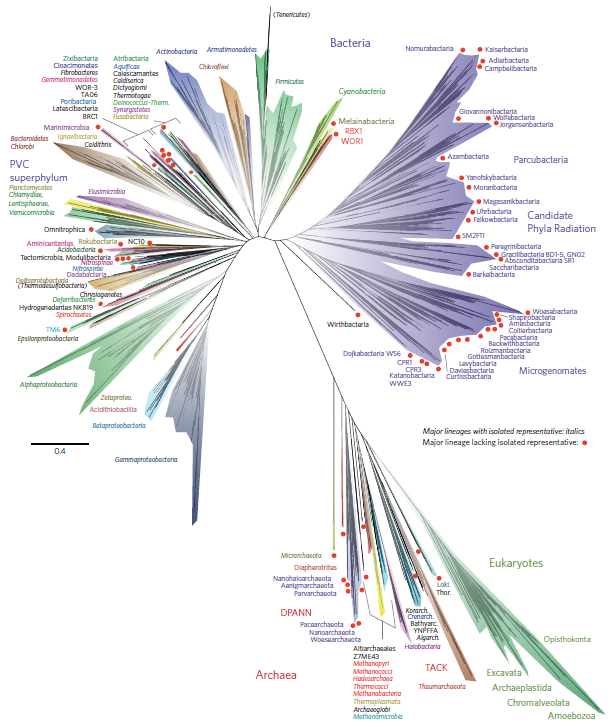 A large and diverse sister group to all other bacteria is identified and corresponds to the CPR, adding a deep and diverse branch to the emerging picture of the tree of life. Hug et al. 's tree confirmed the placement of Eukaryotes within Archaea (lower right) and added a tremendous amount of diversity to the Bacteria with the inclusion of the new CPR (upper right). What are the CPR bacteria? They are indeed very strange. Brown et al. 2015 studied this in detail. The CPR tend to have greatly reduced genomes and cannot carry out some basic biochemical processes of a free living cell such as the synthesis of nucleotides and amino acids. They also have unusual ribosomal RNA sequences (containing introns and protein coding sequences) that would not have been detected using standard techniques. And, they contain signals that are indicative of parasitic cells that are not capable of living on their own. Taken together this helps to explain why it has not been possible to culture these bacteria independently of other cells. They probably depend upon close association with other cells for many basic molecules of life. An outstanding question is what is their role and importance in natural systems. As a final note, this is likely not the end of the story. The world of viruses has been left out of this post completely and there are indications of undiscovered groups of highly divergent viruses out there in the environment (e.g. Wu et al. 2011). This entry was posted in Uncategorized on June 24, 2016 by Floyd A. Reed.